Two years ago a group of women devotees holding a placard citing ‘Ready to Wait’ tried to express their opinion regarding the Supreme Court case on the entry of young women in the Sabarimala Ayyappa temple. It turned out to be a massive movement and women across the globe joined our hands in declaring our respect and devotion for Ayyappa Swami by telling that we are Ready to Wait till we reach the age for seeking His darshan. We still remember the circumstances that led us to release our pain as Hindus, devotees of Ayyappa Swami. Women and men who have no devotion and faith for Hindu temples, traditions were hurling choicest of abuses on Swami Ayyappa and Sabarimala temple. Media and Social media were filled with memes and posts by atheists and liberals. We decided to declare our devotion for Swami Ayyappa and tell the world that we, the women devotees of Sabarimala, know well how to speak, how to express our opinion. We said that we do not need any alien feminists imported from Lutyens Delhi to dictate to us how to live our lives following the traditions of our land and culture. Our only strength was our unconditional devotion to Lord Ayyappa. What followed next was a testimony to the magnificence of Kaliyuga varadan Shri Ayyappa Swami in Kerala. 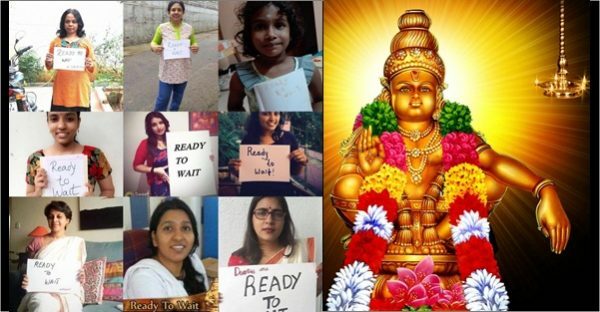 Thousands of women devotees across the globe came forward to join us in the Ready To Wait campaign. Subsequently, with the blessings of the Lord, we were able to reach the court and enter the case, so that the voice of the women devotees shall be heard in along with the noises made by atheists and liberals. The case is now before the Constitution bench of the Supreme Court, and the court has been hearing the Sabarimala case yesterday and today. Seeing the arguments of the petitioners, one should wonder if their real intention is to ensure Gender equality or destroy the traditions of the pagan Hindus by invading their sacred. Every conspiracy theories foisted by vested interests were presented in their submission. The Petitioners argued that Sabarimala temple was initially a Buddhist place. There is no archaeological or written evidence in any Indian text which points to Bauddha character of the shrine. However, they used the Supreme Court to push the conspiracy theories of a few critics. The media are also celebrating random comments in the court today as the judgement made by the court. Are temples Public places? The debate today is about treating temples as public spaces and implementing the secular constitution in the ritualistic practices of Hindus. Their intentions are not pure which is visible from the way they have been applying the Abrahamist point of view on religion and places of worship in the Hindu concepts of temple worship, the rights of the Devata, and fundamental religious freedom of Hindus in India. They are using debunked communist falsehoods to curtail the rights of Ayyappa devotees as well as Hindus as a community. According to them, the 41 days vrata observed by Sabarimala pilgrims is not an essential practice of Hindu dharma. Ignoring numerous temples in India, such as Attukal, Kamakhya, Chengannur, Panchabarahi temple, Mannarassala etc., where women enjoy exclusive rights than men, they try to impose the western notion of forced equality on the unique practices of Sabarimala. The essence of Hinduism is the diversity and uniqueness of our traditions. We evolved as a civilisation by peacefully accommodating all kinds of differences and living in harmony by respecting the privacy of every practices, gods and goddess. We enjoy the right to be different, right to be unique. We celebrate the puberty of girls. We love to be original rather than low-quality copies of the westerners. Hence, again we are forced to say that our temples are not commodities for a secular government to trample with. Our devatas are living beings who reside in their shrines. Each of them has their own impulses and desires. We ought to respect it. That is the beauty of our pagan Hindu civilisation we cherish. Nithya Brahmachari Ayyappa who went uphill into the deep forest of Sabarimala needs peace. He must not be disturbed by the miscreants masquerading as women’s rights warriors. Please don’t meddle our sacred spaces with your dirty breaking India politics. So we are telling it again, the majority of the women devotees of Lord Ayappa are Ready To Wait until we reach the age for seeking his darshan. We respect the wishes of our God. Click here to follow the Ready to Wait campaign in their Facebook Page. Yes, We are Ready To Wait! “WE ARE READY TO WAIT". Because we are DEVOTEES of AYYAPPA and these are OUR RITUALS and OUR BELIEFS.